Shelf management and presentation is the cornerstone of making a first impression to your customers. It presents the product you are trying to sell and it makes it easily accessible for all to see and purchase. An outstanding shelving system gives your store a sense of organization and order. Gondola shelves in particular give you a sense of presentation and depth simultaneously. Attach many of the available accessory options available to present your customers with a truly customizable inventory control and product management system that will help your business grow. DGS Retail is a shelf pusher system manufacturer and a plastic shelf divider supplier since 1979. Save time and hours of labor with a well-designed shelf management system. Our studies have shown that a properly designed shelf management system will save 60% of labor in most product resets and cut-ins. In many stores with a poor shelf management system, customers can aimlessly walk down aisles with poorly stocked shelves and witness items out of place or stock. Understanding your inventory's needs and sales ability will help you develop a shelf system that best suits your business's needs. One type of shelving system is not ideal for every type of product. For products that sell quickly, you want more space to stock multiple products on one shelf. While items that do not sell as often, you may not need that much surface space to make the shelf look fully stocked. You also risk taking away from other products that sell better. Business owners should always consider their shelf system as a means of interaction with the customer. It's the customer's' first encounter with the product you are trying to sell. A disorganized, poorly stocked shelf system may be a turnoff for many customers. Do not have them turn around and walk away. Use uniquely designed gondola shelving solutions to attract business, not turn it away. Gondola shelves with the right accessories have the chance to enhance a business and make it grow. 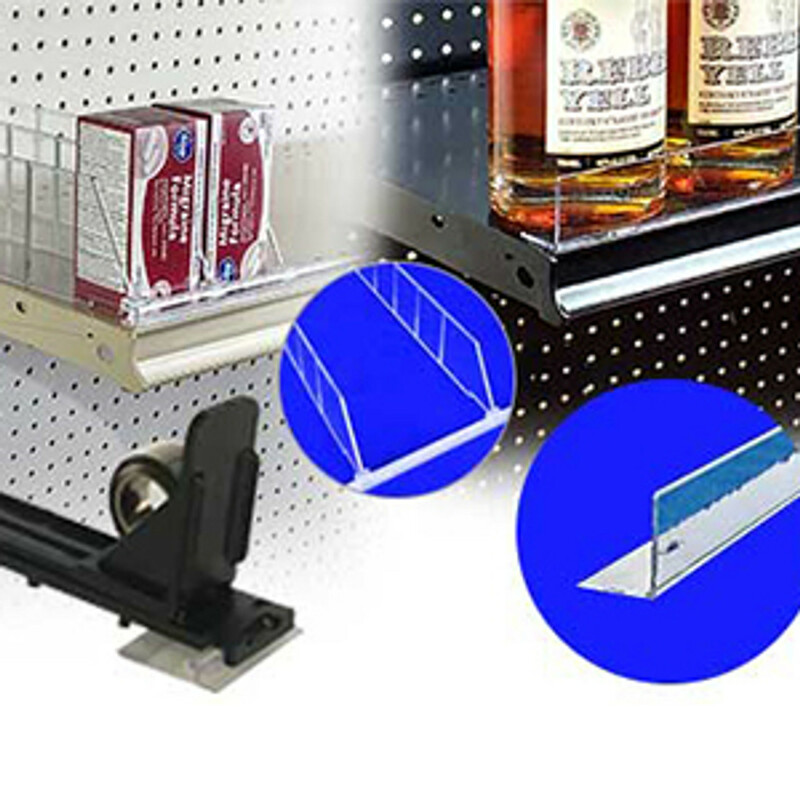 DGS Retail offers a wide selection on retail shelf dividers and shelf pushers. Our shelving systems include the standard height adjustable shelves for heavy bulk items but we also have alternatives that make your shelves seem fully stocked and organized while limiting the need for manual labor to tend to the aisles of your store. Utilize our spring-loaded product pushers to keep your merchandise at the forefront of your customer's minds and reach. Customers should see the product not your shelf. Product pushers are a great way to stay organized and to maintain a healthy appearance of order. You want the customer to see everything your store has to offer. Digging in the back of the shelf makes your business look unprofessional and unattended. A shelf management system is about so much more than the shelf itself. A good system will push your profits as well as the products on the shelf. While you need the shelving system to be strong, dependable and attractive to the consumer, retail accessories enhance what's on your shelf and add another dimension to the organization and product display capabilities of your business. Strategy is key to successful product placement. Pair products that go together with the right shelf management accessories and tools to watch business grow like never before. DGS Retail offers spring loaded shelf dividers and commercial freezer shelf dividers for grocery stores and convenience stores. Many of these feature automatic spring feed pushers that keep your products constantly front faced on the shelves. A successful shelf management systems and retail inventory strategy is especially critical for small business owners who often face the challenge of squeezing a wide array of products into a smaller space than most big box retailers. While you want to carry a lot of products for your customers, you also do not want to appear sloppy and congested. Make the most of your space with some of our most efficient shelving systems that bring the products of your store to life in ways you never thought possible. Maximize your space with products that create a targeted approach to product placement and management. Clean, well-lit and organized shelf systems help customers locate products quickly. The faster a customer can locate a product, the faster they move onto the next item they wish to purchase. Customers don't like to feel exhausted from looking for an item they desperately need. Allow them to find it quickly and easily by staying organized and creating a constant presence of tidiness to your customers. It will have them return often knowing that your business is always fully stocked, neat, organized and clean-looking. Shelf management creates a pleasant shopping experience for everyone. Give customers the ability to purchase more products in less time it takes to find one single item. This increases sales and grows your business. DGS Retail focuses on pharmacy plastic shelf dividers and wine bottle shelf separators for the liquor store display industry. A successful shelf management system should also incorporate one or many of our unique signage opportunities. Communicate with your customers with messages that truly stand out to them and grab their attention. Signage attaching to existing gondola shelves allow business owner to advertise sales, highlight new products arrivals and adds overall visibility to products you want your customers to take notice of. Stationary, pop-out and hinged signage options are all compatible with our shelf management systems and really add another dimension of communication and product placement for your business. Our strategically coordinated shelf systems include the solutions needed to give your stores the clean, professional and polished look it's craving. A successful and properly developed shelf management system can include a combination of traditional gondola shelving of varying depths, with spring loaded product pushers, shelf dividers, hardware and accessories and even shelf fencing if needed to help stay organized. Your business needs all depends on the type of products you are selling. However, one thing is certain, the solution for your business is here. Our universal and fully customizable shelving solutions can be coordinated to best suit the needs of your particular business. Let us be the developer of your new shelf management system. Our full line of products ensure a wide variety of available solutions that your business, its products and most of all, your customers will benefit from.